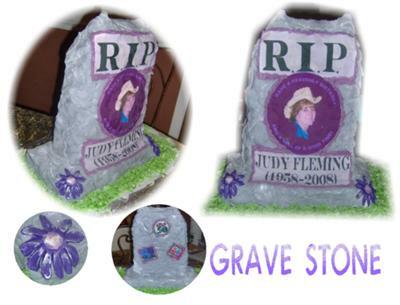 To make this grave stone 50th birthday cake, I made two 9x13 lemon cream cakes. I cut one in half and the other into 1/4's. I made a structure from wood and dowel rods. I used 2 inch dowel rods and screwed them to the 1/2 inch wood board. I took half of one cake and slid it over the rods, then filled it with lemon buttercream. Then I put the other half on top of it for the cake base of the grave. I continued to stack the cakes up filling each between with buttercream icing. I then covered the whole outside with lemon buttercream. I made up fondant the color of stone, a greyish blue tone. I then rolled out small pieces and stuck them to the grave until I had covered all of it. I made a couple of purple flowers to put on each side of the grave and made some edible images to apply to front and back of cake to personalize it. Finally, I made some coconut grass to apply around the grave stone.